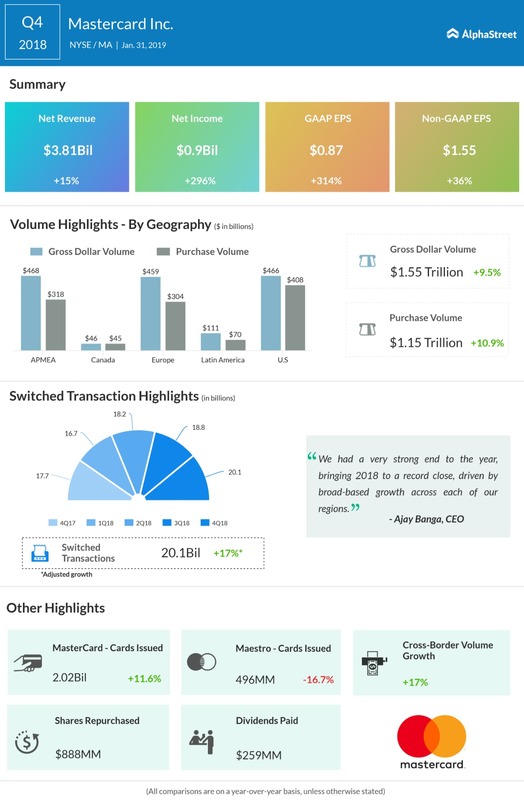 After Visa (V) topped Q1 2019 results on Wednesday, Mastercard (MA) also surpassed its fourth quarter 2018 bottom line estimates today. Mastercard reported Q4 earnings of $1.55 per share on revenue of $3.81 billion. Analysts had predicted Mastercard to earn $1.53 per share on revenue of $3.81 billion. Shares of Mastercard were up about 4% during the extended hours of trading on Thursday. Gross dollar volume (GDV) rose 14% year-over-year to $1.55 trillion compared to $1.42 trillion in the fourth quarter of 2017. Purchase volume grew to $1.15 trillion from $1.03 trillion in the year-ago quarter. Switched transactions surged 17% on an adjusted basis to 20,124 million. Mastercard had issued 2,518 million Mastercard and Maestro-branded cards, representing an adjusted growth of 7%. 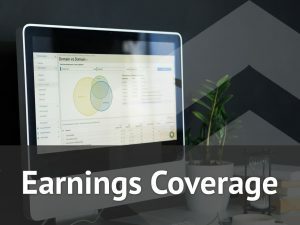 “We had a very strong end to the year, bringing 2018 to a record close, driven by broad-based growth across each of our regions,” said CEO Ajay Banga. Last week, Mastercard was fined $648 million by European Union, which accused that Mastercard artificially hiked the cost of doing credit card transactions in Europe. On Thursday, Visa reported better-than-expected quarterly results. However, Visa cautioned about the recent slowdown in the cross-border growth and said that Q2 revenue growth is likely to be at least a point lower than the previous outlook. Visa stock was down about 2% during Thursday’s morning trading session. Mastercard stock has gained 10% in the last 30 days and 3% in the past three months period.